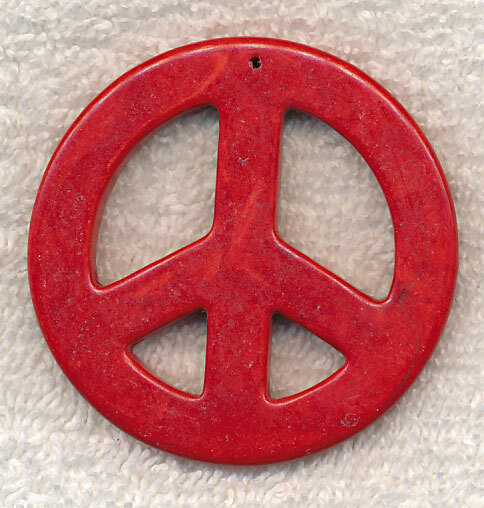 FINAL CLEARANCE Wholesale Large Red Magnesite Stone Peace Sign Pendants for your jewelry creations. This large size stone peace symbol pendant works perfectly as a focal. Sold by Piece - must take last 12 pieces. Colorful Magnesite Beads and Pendants have been one of our most popular gemstone lines for several years now. Magnesite is a carbonate mineral that is commonly dyed various colors, sometimes to look like other more expensive stones such as turquoise. Magnesite is used by crystal healers to assist in lessening PMS symptoms and strengthening bones. Some say it brings peace during meditation, stimulates passion, and assists in creative visualization.